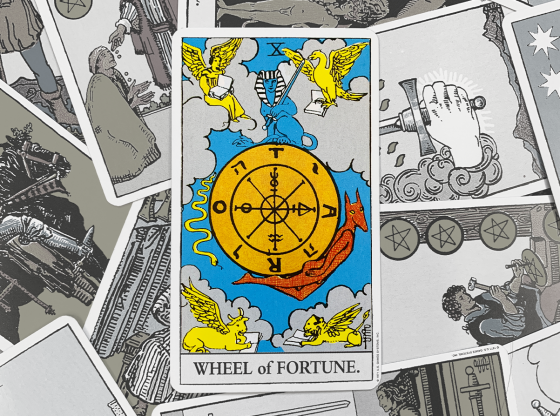 The Tarot forecast for the week of August 20 – 27 describes the mood and events that are likely to occur in your world during this forecast period. 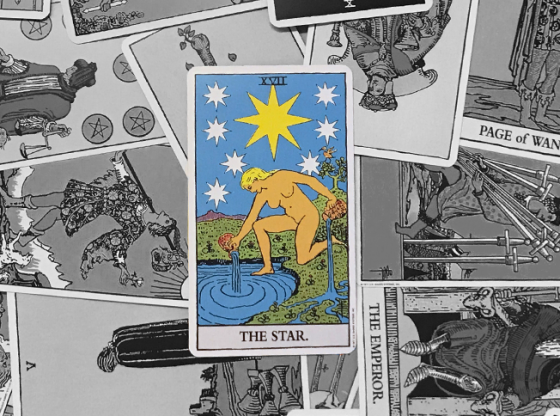 The Tarot spread also describes the important energy from the recent past that has led to energy that will be released on Friday, August 20. The past can be seen as having established an influence, the present (this weekend) can be seen as the action, and the future (the beginning of the workweek and beyond) is best seen as the resolution that will soon take hold on that influenced foundation. The Five of Cups has been drawn in the past position. Leading up to this weekend you may have been slowed by some regrets. Your energy of late has been self-directed and isolating. You feel that you have less now than in the past. This approach could be holding you back. You might be mourning a past relationship. Everyone deals with loss in a different way, but you may have been wallowing in the identity of victimhood. Swimming in self-pity leaves you soaked with loneliness. 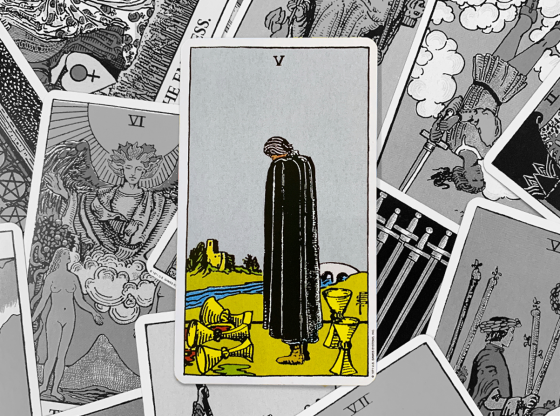 The Five of Cups features a character hiding his or her face in shame. A black cape symbolizes choosing darkness over daylight. That lone figure pulling their cloak over their face is a metaphor for living in denial. 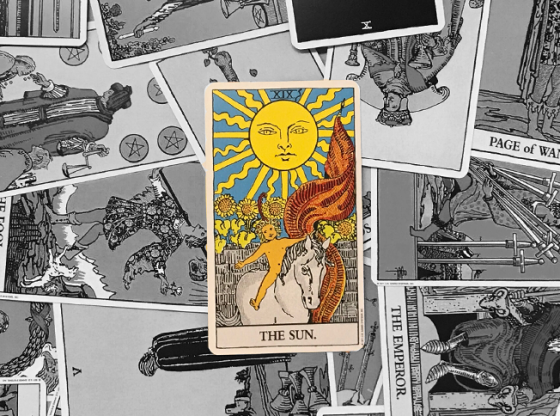 This living in darkness is a way to ignore the bright light of day; for all its sadness, the Five of Cups is actually one of the brightest cards in the Tarot deck. The world around you is actually pretty nice. Life is good if only you will remove the cover of your self-imposed exile. Note that there is nobody else pictured in the Five of Cups card. Nobody has been keeping you from seeing the light of day but yourself. You seek to keep your head bowed, but note the river in the Five of Cups … that river is time and it keeps flowing. 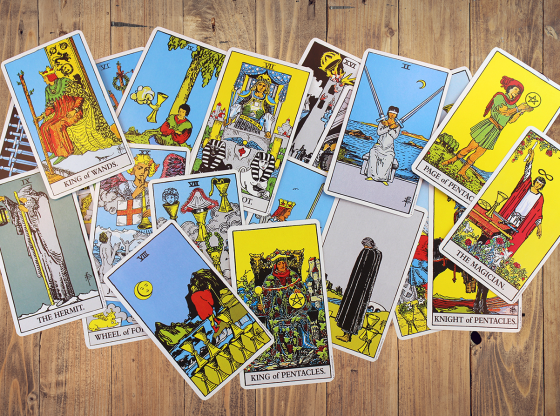 Cups are the Tarot’s suit of emotions. Three spilled cups have put you into a somber state, but behind you are two cups undisturbed. Perhaps you have regrets for the time you have wasted and are feeling sorry for yourself for what might have been. You are about to realize that self-pity is actually a luxury. 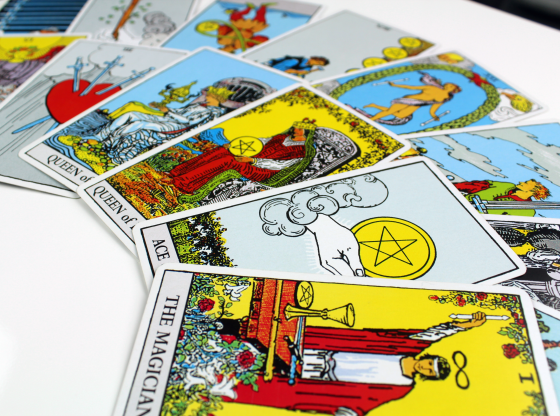 There is an authoritative message coming your way; it may or may not give you comfort but it will take away any time you might have had to ruminate on loss. 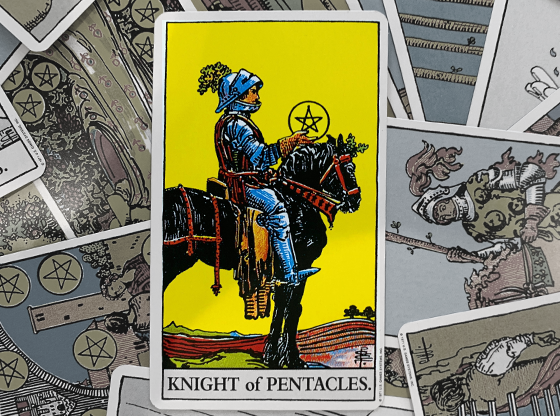 The present position in this Tarot forecast is occupied by the King of Swords. Your recent avoidance of moving on with things will be ended, as a source of authority to which you must respond beckons. This is a weekend where many people will make big commitments and others will bend to the words of an authority. Have you been in avoidance mode lately? 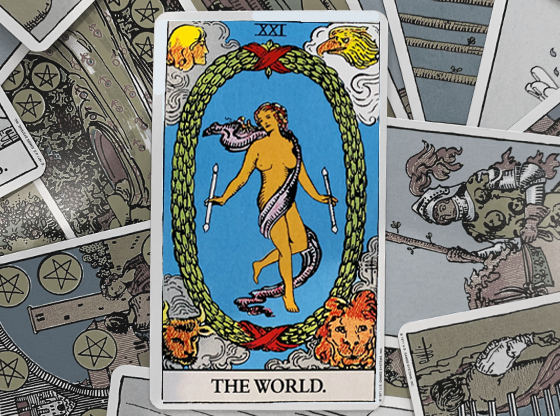 A firm and definitive call to action has arrived in the person of the King of Swords. This is a card that assures you of one way to do things and insists that it is the only way. The King of Swords is about firming up the malaise. In the illustration on this card, the viewer is staring directly at the king. This way, there is no ambiguity in the ideas expressed to you on Friday, Saturday or Sunday. You are looking into the face of an idea that will guide you. Kings are archetypes of authority. You of course have the free will to resist the demands being made on you. Where will that leave you? The King of Swords creates doubt about taking a different path. The ideas that are being expressed to you at the present will be one way of resolving current crises, but you must acknowledge that in following the plan that has been given to you, a major shift in how you conduct yourself will occur. 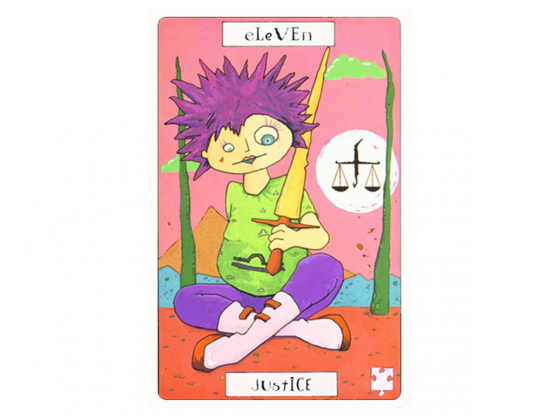 The King of Swords appears in a Tarot reading when mental discipline is the primary concern. Your thoughts must either submit to a method at this juncture or you will be forced to come up with new ways of perceiving your place in the world. Perhaps a friend or family member confronts you about your holding on to your regrets, or maybe you look at yourself in the mirror and acknowledge that it is time to move on. Maybe you will find comfort in a book or other work of art that has formed who you are and expresses your values. The written word is an excellent manifestation of the King of Swords. Can you heed it? The way you have been approaching things has been confronted by a firm, authoritative idea that is hard to dismiss or avoid. Your most likely course of action will be to avoid the logic in what is being demanded of you and dig in your heels. 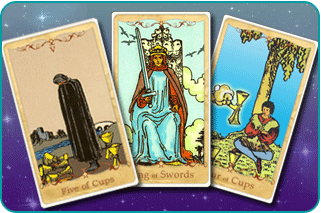 The Tarot forecast is rounded out by the Four of Cups in the future position. An emotional stubbornness will crop up late during the workweek and you will be left disconnected to your old feelings. The King of Swords has successfully challenged your past resentments. But the King’s work has been left undone, as being confronted by the truth of his words has left you resentful of the logic to the analysis of your situation. No matter how you look at the advice you have been getting, none of it takes into account your emotional attachments. The Four of Cups shows a young man ignoring the offer of a cup from a hand in a magical cloud. This is a metaphor for stubbornly refusing the gifts that the universe is offering. Your future is one of holding off on growing from the lessons you are learning in the present. 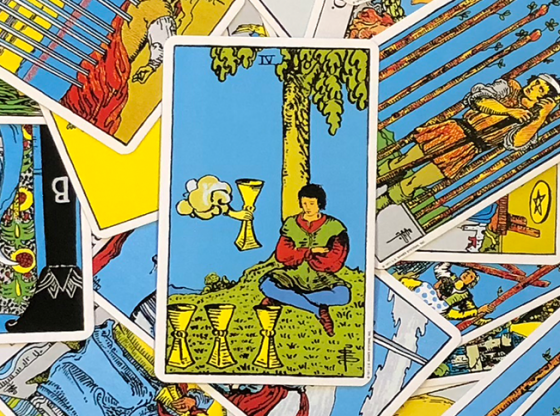 If you had been sulking and avoidant as illustrated by the cloaked figure in the Five of Cups, it is easy to assume that the inspiration of some great idea or philosophy would allow you to move on. But the chance that your mood has inspired a confrontation from a loved one that has left you feeling embarrassed and ashamed could lead you into a period of holding off on personal growth.